One interesting detail was how to handle the "Generate Solr Schema" step. This is normally done through the Sitecore Control Panel, and is responsible for updating the Solr schema.xml file to include definition of fields like "_uniqueid" and "__bucketable" that are required for Sitecore. To automate this step, I considered analyzing the changes and writing a script to apply them, or even copying a prebaked "schema.xml" to the Solr instance directory, but this didn't feel ideal. 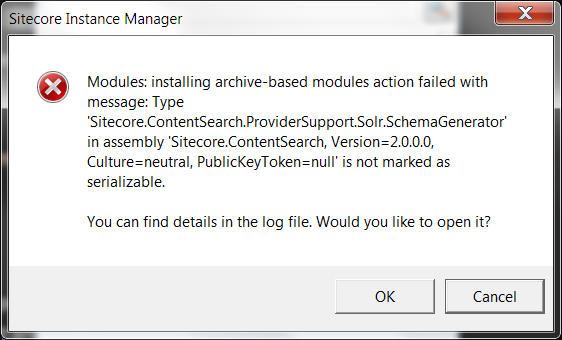 Suppose a new version of Sitecore introduces a new Solr field (let's say "__basketable"...). My feature would be instantly obsoleted. Bummer. It would be far better to use the actual code that is run by this option, and with a little digging, I was able to find the C# class that does the transformation, Sitecore.ContentSearch.ProviderSupport.Solr.SchemaGenerator, in the Sitecore.ContentSearch.dll. What if directly loaded that from the bin directory of the new instance? That worked nicely. Now you can create and delete Sitecore+Solr instances all day long!